This is an historical novel set at the beginning of the 20th century told mostly through the eyes of an anonymous narrator. As normal in Doctorow's novels real people feature in fictionalisd settings. Here we have Houdini, Henry Ford and J. P. Morgan. Most of the novel is set around the deprivations suffered by the poor and black when dealing with the huge industrialists that came to the fore at this time. It ends with one man trying to start a private war as a result of a huge injustice he endured. Again, with many Doctorow novels he starts up a character who is given what appears to be a leading role but after a few chapters just disappears. You don't hear from them until a small explanation at the end of the book but that's him and he did this often. 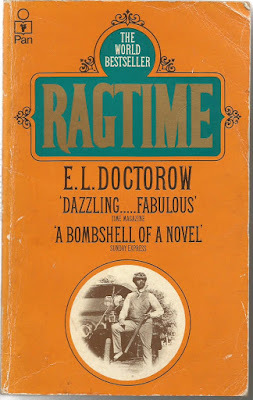 A rear cover blurb on my copy states -Ragtime is the most acclaimed novel ever published- this is a major stretch " Billy Bathgate" and "The March" are both much better but this is quality and worth reading.